We live in an age of complete lack of accountability. Our institutions fail regularly. And there are no consequences. When American politicians used to violate the public trust by lying, they faced consequences, like being voted out of office or resigning in disgrace. But that’s not the case anymore. Today, our ruling class lies about issues both big and small without consequence. It happens on both sides of the political aisle. The public does nothing about it. And the Deep State uses this apathy to further cement its control. What once happened only in banana republics and dictatorships is now happening regularly in the U.S. And unless free citizens start holding their elected representative accountable to the truth, we will never regain control of our country from the clutches of the Deep State. Hillary Clinton is an agent of the Deep State. And she was a big supporter of the Transatlantic Trade and Investment Partnership (TTIP) trade deal until Trump made it so unpopular. The Obama administration kept it shrouded in extreme secrecy. The text of the deal was kept in the basement of the U.S. Capitol, in a bombproof room, only accessible by U.S. Congress members. Transparent democracy at its finest. Well, as details of the deal started to leak out, we started to see why it was kept double-secret. The main goal of the deal is to protect global megabanks and U.S. bond rating agencies from claims by investors who were cheated during the debt crisis. That’s just more evidence that the Deep State will eat your financial health alive. Will Hillary resurrect it if she’s elected? But the Deep State’s grand plans may be disintegrating before our eyes. June’s Brexit vote was a critical battle in the long war against the Deep State. British citizens decided they’re tired of surrendering their democratic rights to multinational corporations, unelected bureaucrats and feckless central bankers whose policy goals are at direct odds with regular people. It dealt a deathblow to the Eurocrats’ one-world government dreams. And with the European Union teetering, France wants its own EU referendum. Now millions are clearly losing faith in the power of once godlike central bankers. QE, ZIRP and NIRP have failed. And the price of gold is rising as investors have begun realizing that the monetary overlords have run out of bullets. The Deep State has kept its vise grip on power through a rigged system. But what happens when the manipulated masses realize that system is finally breaking down? We may soon find out. Below, James Howard Kunstler shows you why our debt-based economy, which the Deep State depends upon, is collapsing around us. 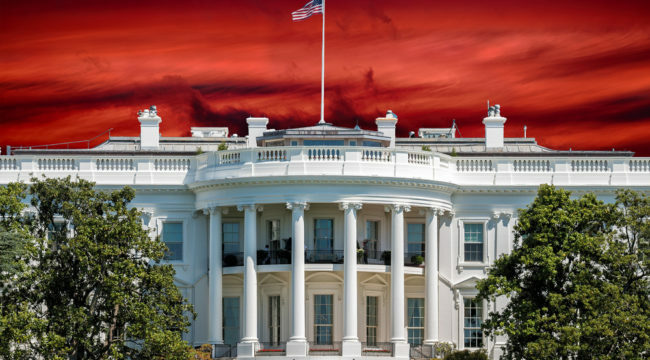 Will the Deep State collapse too? Read on.